Velocity and show in the Sepang circuit , how in the duel in the last bend in the season 2006 between Rossi and Capirossi , that seen win and go up on the higher step of the podium. "The doctor". 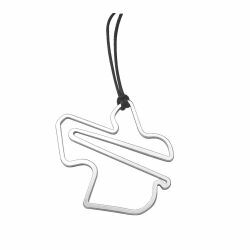 Spectacular is the pendant created by Gianfranco Quartaroli , realised of steel in order to resist in the time finished by hand, shone and rodiado with the best techniques Valencian goldsmiths. Perfect union between sport and elegance, the jewel will can wearing in each occasion , showing energy with passion. The dimensione of this product 40mm , studied for who want wear with elegance and discretion his sporty feeling but not be unseen. -the official copywriter Moto GP. Free with the expedition an elegant package of gift.